These two free weeks come from my 3rd Grade Math Morning Work Set. Week 4 gives a glimpse on how the morning work sheets are set up for the first half of the year, and week 20 gives a glimpse on how the morning work sheets are set up for the second half of the year. 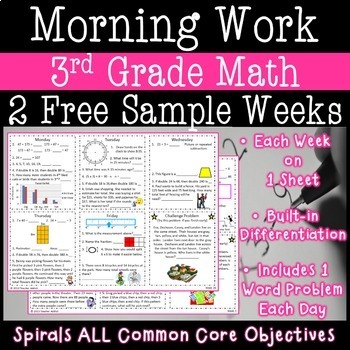 The whole product covers and practices ALL of the common core objectives for third grade math. Monday through Friday are on one page, so you only have to print one page for each student per week. In addition to having work Monday through Friday, there is also a challenge problem for students to work on if they get finished early on any of the previous days. Basically, it is a built in differentiation piece. The paid products have additional items and the ability to be edited! I also have a freebie from my 2nd, 4th, and 5th grade daily math review. If you download this, you will want to click the scale-to-fit button when printing-not the actual size to make it a little bigger on the paper.